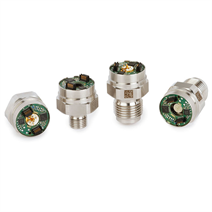 The model TI-1 pressure transducer serves as the core for the widest variety of products such as pressure transmitters, data loggers, pressure controllers or as components in hand-held measuring instruments. WIKA uses the TI-1 as the basis of pressure measuring instruments for the highest industrial requirements. This guarantees a security of supply over many years. As a customer, you profit from our long experience in the field of sensor manufacturing and compensation. The pressure transducer is manufactured on state-of-the-art production equipment, enabling the greatest flexibility and fast lead times. The manufacturing concept offers continuous traceability for each produced unit, down to an individual component level. A wide range of designs in the area of process connections and mechanical connections to the case is already available. On request, further customisations can be developed in order to meet customer demands to the full extent. As output signals, digital signals such as UART, I²C and SPI or an analogue voltage signal are available. Via the digital interface, the sensor unit can provide a wide range of information, e.g. the sensor temperature. Following assembly, a zero adjustment and span correction can be carried out.